It takes a certain type of car enthusiasts to cover nearly 50,000 miles in a 100-year-old Ford Model T but in the last 5 years the Regters have done just that raising tens of thousands of dollars for charity in the process. In this video Dirk Regter tells us about the journey so far and how they need your help to continue the adventure. In the summer of 2012 Dirk and Trudy Regter from the Netherlands started a journey around the world in their 1915 Ford Model T.
In 2013 they resumed their adventure. Driving through the USA and Canada, crossing 22 States, 17,000-miles and in 2014 they drove another 16,000 miles through South America. The Regters, have owned their 1915 Ford Model T since 1997. They’ve covered nearly 50,000 miles so far, visiting projects and raising money for various projects run by the international children’s aid organisation SOS – Children’s Villages. Even in a car as notoriously robust and easy to work on as a Ford Model T, the journey hasn’t been without it’s challenges as Dirk explains. Although the biggest challenge so far happened much closer to home as the Model T was involved in an accident when it returned to Europe. 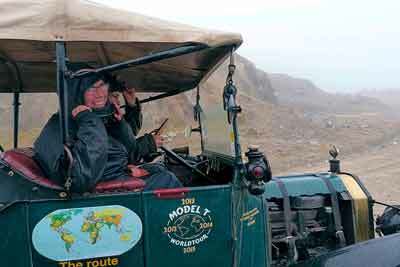 Happily the couple were unhurt but they need help to repair the Model T and continue their journey through New Zealand, Australia, Indonesia, and India, crossing the Himalayas to China, through Mongolia and back to the Netherlands via Central Europe. Which if all goes well will happen later this year and into 2017. The Ford Model T is famous as the world’s first affordable motor car and an icon of mass-production. The Model T was the car that really got the USA driving on four motorised wheels. Ford built 15,000,000 Model Ts between 1908 and 1927. Production started in the USA but soon spread with assembly plants in Denmark, Germany, Ireland, Spain and at Trafford Park in the UK. The Regters’ Ford Model T is powered by a 3.0-litre petrol engine in standard 1915 factory specification. The only modification (and one that even purists can forgive is) they have made is in fitting larger tyres to the wooden-spoked wheels, which gives a more forgiving ride on longer journeys.